Mackerel fish is popular in Goa. 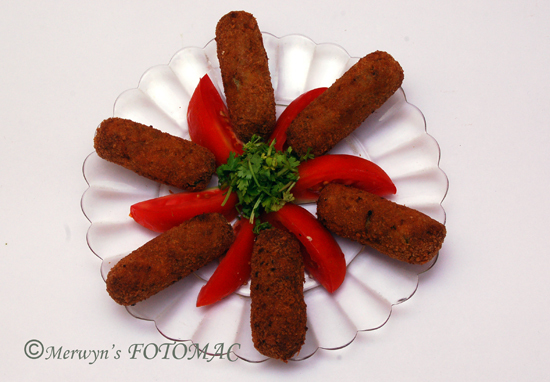 Goans love this fish in any form – plain fried , stuffed with masala, salted & dried, steamed, curried & made into croquetas. It has many fine bones so one has to have a lot of patience while eating it. You can use any chunky fish which has less bones if you wish to make these croquetas but I love croquetas made with mackerel. Clean the fish ( remove scales, gills etc. ).Wash the fish well. Place the whole fish in a wok or deep pan with water. To this add the sliced onions, green chillies, garlic, ginger, turmeric, lime juice, a pinch of salt & boil on med. heat till the fish is cooked & tender. Take it off the heat & cool. Separate only the fish from the liquid. Separate bones, if any, from the contents in the wok. Using a knife or your fingers, gently separate the flesh from the centre bone. It should come off like a fillet on both sides. Without mashing the fish separate the bones from the fillets. To do this, divide each fillet gently into two parts & remove the fine bones from the divided parts. Make sure the fish is without any fine bones. In a food processor or blender grind the fish along with the contents from the wok along with the liquid. Transfer the mix in a bowl & add half of the beaten egg, 3 tbsps bread crumbs, pepper pwd., coriander leaves & salt to taste. Mix it together with your hands. Roll small portions into croquetas & place in a plate. Spread ½ cup bread crumbs & mix with 1 tbsp. cornflour in a plate. In a small bowl mix 1 tbsp. cornflour along with remaining half of the beaten egg & 6 tbsps. water & mix well. Then dip each of the prepared croquetas in the liquid mix & roll in bread crumbs in the plate. Place them in another plate making sure they do not touch each other. Refrigerate for 15 mins. Heat vegetable oil in a large wok on med. heat. Slowly lower the croquetas in small batches into the oil without overcrowding. Fry them by constantly turning them so that you achieve a uniform golden colour & they turn crisp. Transfer them on a plate lined with paper towels. Serve hot with ketchup or any sauce of your choice. 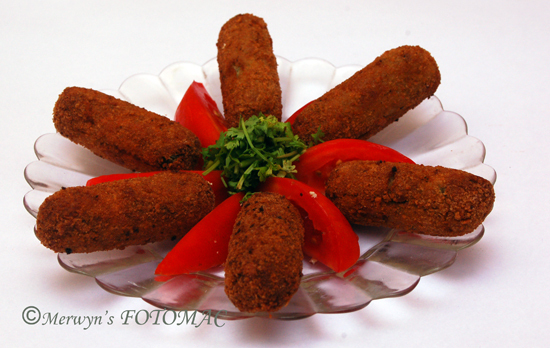 Note : Croquetas is the Spanish word for Croquettes, which for many, is difficult to pronounce. We followed the recipe EXACTLY (which we seldom do) and were really pleased with the results. There is no fish on earth that is tastier than the good old bangda, and this is a great way to enjoy it without having to deal with the bones!